Sixth child (of nine) of Mr And Mrs Arthur Perciful Dix of St Andrew's, Timaru. Peter Bennet recounts that: "... From the monthly war gazette, Gerald was shown missing in action for around 6 months lying in no mans land dead. Recovered around April 1918, the Gazette then showed him as officially dead and like many other parents of children gone to war, they received an official letter to tell them there son was no longer missing as his body had been recovered with his tag on the hills of Passchendaele." 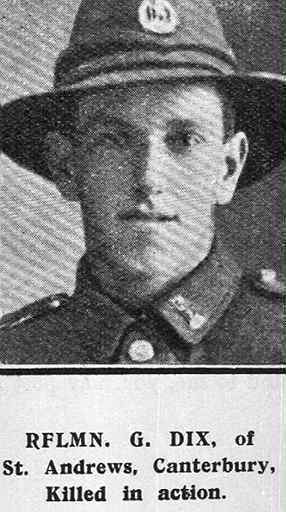 Gerlad's borther, Arthur George Dix, also served, being wounded at Gallipoli.